This wash day was supposed to be a quick one. Cleanse, deep condition, rinse and style. But then, I noticed it. Unruly grays fighting their way through. It has been about 2 months (maybe longer) since I’ve done a henna application on this fine natural hair so I had to pull myself out of the lazy slump and just get it done. Otherwise, I’d have to go an additional week with these little white hairs taking over the front of my head. Don’t get me wrong. There’s nothing wrong with having gray hair – if you like it. I however, don’t want them crowding out the other hairs on my head. At the very least, they should be a bit more respectful and hang out toward the back of my head where I can’t see them! The plan was to keep the henna in my hair for about 2-3 hours. About 7 hours later (as I’m writing this post), henna is still in my hair! But it was all worth it. Fast forward (it’s tomorrow, the day after I started). Look at how stunning and defined my curls are! Not one to toot my own horn but I have to say this. The BEST wash and go curls come just right after a henna session (and these are stretched curls). The oil was used used to seal in the moisture and then I used it again after my gel application to soften the set. As EcoStyler gels dry, they leave a bit of a gel cast which I’d prefer not to have to break. The oil softens it up some as the hair is drying. The results of using henna on your hair can be seen after just one application but it’s the residual effects you want to experience after using henna again and again. It’s God’s gift from nature, really. Kind of like ginger. So, if you’re looking for smooth and sleek curls, forget the rollers and curl killing heat appliances. Embrace our own curl pattern and watch how smooth your curls are right after using henna. Trust me. I wish you could reach through the screen and touch it. 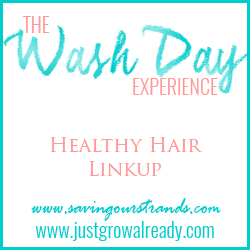 Note: Smooth & Sleek Curls was the theme for the Wash Day Experience Healthy Hair Link Up this week. Next PostAre You Sure Your Hair’s Really Heat Damaged? Hi there, do you prefer this henna to Red Raj by Henna Sooq? Love your blog! Look at those lovely curls! So sleek and defined! I’ve had henna on my “to do” list for years. (No—seriously…YEARS) Thanks for inspiring me to finally make it happen! LOL girl just do it. A henna gloss may be better if you’re not going for color coverage though because the process is so timely! I wasted so much time on Saturday and literally had it in for maybe 8 hours!